Could you add in SIM result how many rounds the battle last? It could help to use optimization of the SIM. Ok added it to general tooltip in sim results when its possible to determine it. When doing SIM for the camp with more generals, it is a little bit annoying to change units for each single general for next camp. What about to add into the TOP some checkboxes where I will change (mass change) which units I would not to use for SIM? I am testing with all units for all generals. When I added the per general checkbox for Knights I was also about to add "Don't simulate any marksman if the enemy has first strike with flanking" but then was not sure if it covers all cases and if there is even more. All settings need to be per general cause Vargus for example removes flanking and there might be new generals in future. when I changed general skills setup (MMA - skill - increased troop load +15) it has not been changed with generals already assigned to Attack wave. I was unable to load more than 220 unist. If you had the view open while changed general and did not select other camp to "refresh" view this can happen as it still has the old info about the general. Idea: what about to allow to reSIM best results by step 1 troop? Example: best attacker for a camp is NUSALA with 40MS and 140AM. The SIMM will add +-10(20) troops to both sides and reSIM this best attack step by step from 30MS 150AM to 50MS 130 AM (step 1 troop / 500 SIMs). Yes it's on my list of possible stuff and tried it last time when I added the unit increment setting. Hello, I wanted to ask you if it can be useful to indicate the number of troops to take to adventure. In the Map Summary above. I thought the insertion of the manual troops. A section similar to the generals but without them, with only the normal and elite troops all together, once selected except and I see them in the Map Summary. Next version has "Edit map info..." option to select troops and enter free text that will be shown at top. The point was to have all units selected per general and disable some units (globally) to be ignored during testing. When I am testing a camp, I have some basic Idea which units to use or not. System.Collections.Generic.KeyNotFoundException: De gegeven sleutel is niet aanwezig in het woordenboek. Yep I understood that. I might add them later. For now I'll add the one checkbox I already had started at one point since it will work with all generals and simulation types. There are no official translations for unit abbreviations (ie. 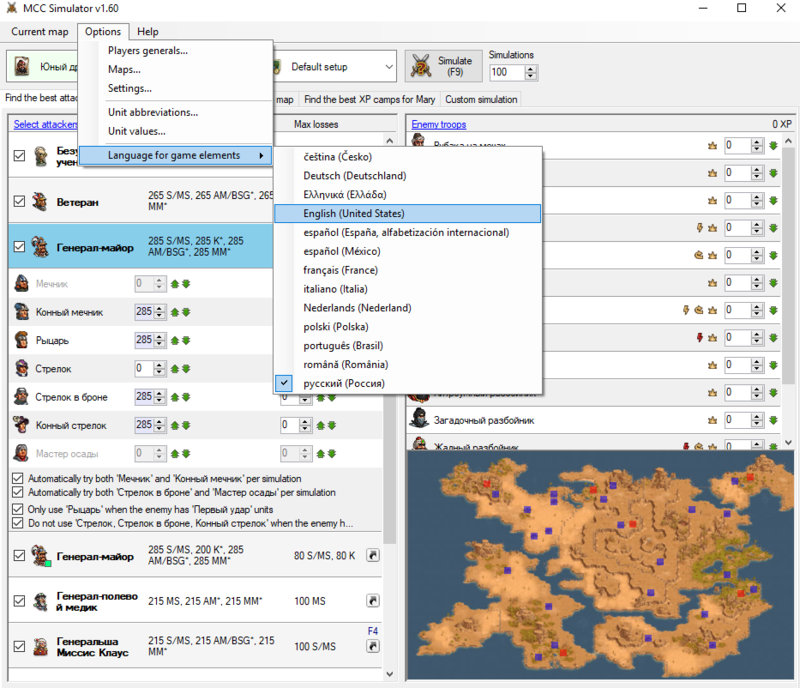 Mounted Swordsman -> MS) so users can edit them with the new dialog if they want to use their regional ones instead of the default English ones. Last edited by Mannerheim; 02.09.18 at 20:31. System.IndexOutOfRangeException: Index je mimo hranice pole. I try to clear all camp settings on a current map. Same error. Same error for Mountain Labyrinth map and Giant Battle. Last edited by LosAngel; 05.09.18 at 11:33.